A University of Michigan product, Jack Johnson has been impressive; even though he has recorded just one goal and four points in 29 games. Scott Niedermayer’s return to the Ducks is imminent. Niedermayer is expected to suit up for Anaheim’s game Wednesday against Vancouver, which means the best defenseman in the division — and maybe the League — again will reside in Anaheim. 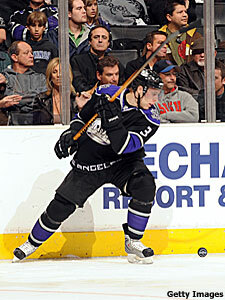 Sometime in the near future, though, the best defenseman in the Western Conference may well be found in Los Angeles. The Kings have been a disappointment this year, but defenseman Jack Johnson has delivered. A 20-year-old University of Michigan product, Johnson has been impressive; even though he has recorded just one goal and four points in 29 games. Johnson, 6-foot-1, 201 pounds, is a physical presence at one end of the ice and an offensive threat at the other. Johnson is the heir apparent to Rob Blake as the anchor of the Los Angeles blue line. Johnson recently purchased his own condo in the South Bay area of Los Angeles — its previous owner was Luke Walton of the Los Angeles Lakers — but prior to that, he had been living with Blake. Blake, who is in the final season of a two-year deal with the Kings, is grooming his replacement as the team’s defensive leader. Johnson’s humility and ambition are admirable and nderstandable. There hasn’t been much reason for excitement this season in Los Angeles, but Johnson does not believe the tough times will last. Joining the Kings was a shock for Johnson. Losing is something Johnson isn’t used to, as the Kings are battling Phoenix to stay out of the Pacific Division cellar. The Indianapolis-born Johnson moved to Michigan with his family when he was 3. For high school, Johnson attended Shattuck-St. Mary’s in Faribault, Minn., where one of his schoolmates was Penguins star center Sidney Crosby, and the two remain close. Even though Johnson has little losing experience, he’s confident all the pain and suffering will pay off. Johnson’s lone NHL goal came against Vancouver’s Roberto Luongo, Oct. 19, in Vancouver. Johnson still feels a debt of gratitude every time he walks into the Los Angeles locker room. Last season, he was at Michigan, balancing athletics with academics. This season, it’s all about hockey. WHO’S HOT – Anze Kopitar of the Kings has five points (one goal, four assists) in his last two games. Kopitar’s linemate, Dustin Brown, had four points (two goals, two assists) in the Kings’ last two games. …Anaheim’s Ryan Getzlaf had four points (two goals, two assists) in his last two games…Phoenix goalie Ilya Bryzgalov is 2-1 and has allowed only four goals in his last three games. WHO’S NOT – Samuel Pahlsson of Anaheim has not scored and earned a minus-3 rating in his past 11 games. …Niko Kapanen of Phoenix is scoreless in his last eight contests and teammate Daniel Carcillo has not picked up a point in his seven games. THE WEEK AHEAD – After wrapping a three-game road trip Monday in Columbus, the Ducks return home for three games. They’ll host Vancouver on Wednesday, Minnesota on Friday, and San Jose on Sunday. Dallas concludes a four-game homestand Thursday against Los Angeles. The Stars will visit San Jose on Saturday, Edmonton on Dec. 18, Vancouver on Dec. 20, and Calgary on Dec. 21. Los Angeles visits Chicago on Wednesday and Dallas on Thursday before hosting Minnesota on Saturday. After winning the first of six-consecutive road games against the Kings on Saturday, the Coyotes will travel to Long Island on Thursday, New Jersey on Saturday, New York on Sunday, Philadelphia on Dec. 18 and San Jose on Dec. 20. San Jose plays three straight at home, hosting Minnesota on Tuesday, Vancouver on Thursday, and Dallas on Saturday, before facing off with the Ducks Sunday in Anaheim. The Sharks are tied with Dallas for the division lead with 34 points and are two ahead of Anaheim.